A lot's been going on here and at my column for the San Francisco Chronicle. But I just got back from a day in Central Valley California, learning about figs and how they're preserved by drying (but that we will deal with much later and make a very tasty jam). We even saw some almond trees! For now, I wanted to share with you some of my recipes from the column that I've been cooking up, a little savory and a of course, a little sweet! There's a prawn and chorizo pulao inspired by Goan chorizo (and what I do since it is practically impossible to find outside India), a look back at San Francisco's Oyster Loaf with my special take with a bit of semolina, an easy toasted naan and tomato salad and of course, dessert, this roasted summer sweet corn custard tart with cardamom. I do have a special request from all of you that have already purchased my book, Season or plan to, please spread the word about the book and share it with your friends and family. I'd be extremely grateful for your help! Thank you. 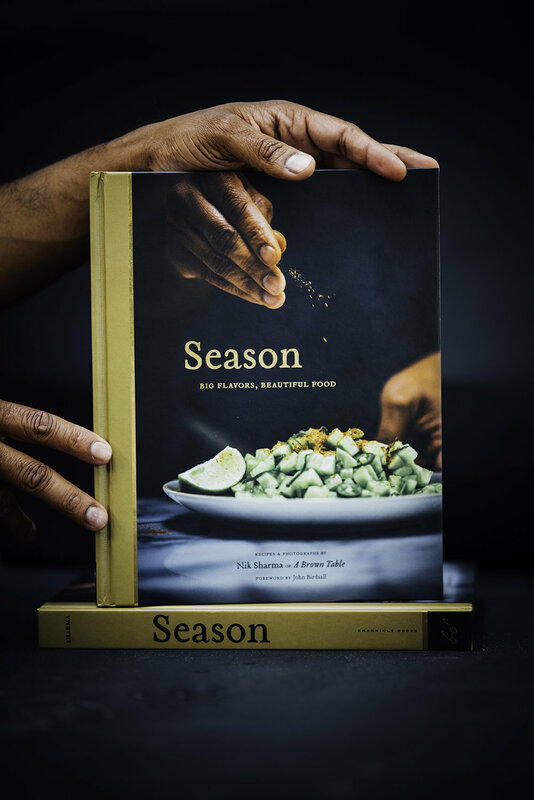 Season was also named by EATER as one of the most anticipated cookbooks of this Fall. There's a really nice excerpt on some of the recipes you can expect to see and cook from the book.